A militia group blamed for atrocities in DR Congo is largely composed of children, while a militia formed to defeat it is suspected of ethnically-based massacres and rapes, UN investigators said. Their report, detailing violence the UN said may amount to crimes against humanity, shines a light on the role of children in a conflict that has killed thousands. It was based on testimonies from people who fled the violence in Democratic Republic of Congo to Angola. “Their accounts should serve as a grave warning to the Government of the DRC to act now to prevent such violence from tipping into wider ethnic cleansing.” UN High Commissioner for Human Rights Zeid Ra’ad al-Hussein said in a statement. One militia group, Kamuina Nsapu, has been fighting Congo’s government for a year and has summarily executed at least 79 people, the UN report said. “A great majority of the Kamuina Nsapu elements are children, girls and boys some as young as seven,” it said. The refugees were convinced Kamuina Nsapu had magical powers and militia members believed their magic — including young girls drinking the blood of decapitated victims — would make them invincible, the report said. There were no corroborated cases of Kamuina Nsapu committing large-scale killings based on ethnic identity, the report said. Typically its members would execute a government official and decapitate them, removing the head to put it in “sacred fire”. A second militia group, Bana Mura, was formed in March or April, allegedly armed and supported by local leaders and officials from the army and police, to attack the Luba and Lulua ethnic groups, to which Kamuina Nsapu fighters belong. “While Kamuina Nsapu are reported to conduct targeted killings — mostly of State agents and individuals suspected of practicing sorcery — since April 2017, Bana Mura allegedly undertook a campaign aimed at eliminating the Luba and Lulua populations in the villages they attacked,” the report said. 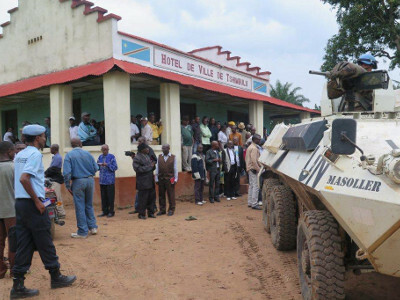 Bana Mura were often accompanied by Congolese soldiers, responsible for atrocities including firing rockets into a church in Djiboko on 10 June, killing 60-90 people attending a religious service, the UN report said, citing three separate witnesses. In one attack on a village, Bana Mura shot, chopped up and disembowelled people. Many were beheaded or burned alive, including patients in a health centre, the report said. A woman still bleeding from childbirth was raped with the barrel of a rifle. After a Bana Mura attack on another village, a witness claimed to have buried 45 decapitated bodies, the report said. “Some elements of the Bana Mura militia were reportedly chosen and used by State agents for their alleged magical powers to neutralise the sorcery used by the Kamuina Nsapu,” the UN report said. The UN has identified 80 mass graves in the Kasais region.